This upcoming April 2009, during Milan’s most important design week, Aqua Creations led by designer- artist Ayala Serfaty takes on the challenge of redressing the city’s trendy Nhow Hotel and momentarily transforming it into an Aqua Creations Hotel. Ideally located in the hub of the International Press Center in the heart of Zona Tortona, the exhibition will unveil Aqua Creations’ bold new one-off pieces. The new range of inspired designs showcased will include a combination of lighting and furniture designs made of naturally soft and pliable materials such as hand-made felt, clay, and angora. Visit the Aqua Creations website – here. Visit Ayala Serfaty’s website – here. Exemplifying Ayala Serfaty’s warm and organic style, the statuesque Apaya floor lamp rises to a height of 180 cm and is made from hand-crafted mohair and angora felt mixed with pure silk, dressed over a clear cylinder. Being the first of its kind, the Apaya floor lamp will set the tone for a new hand-crafted felt sculptural lighting collection by Aqua Creations. Naturally pressed and applied in an undulate form, the particular handcraft presupposes limited edition series and one-of-a-kind creations. 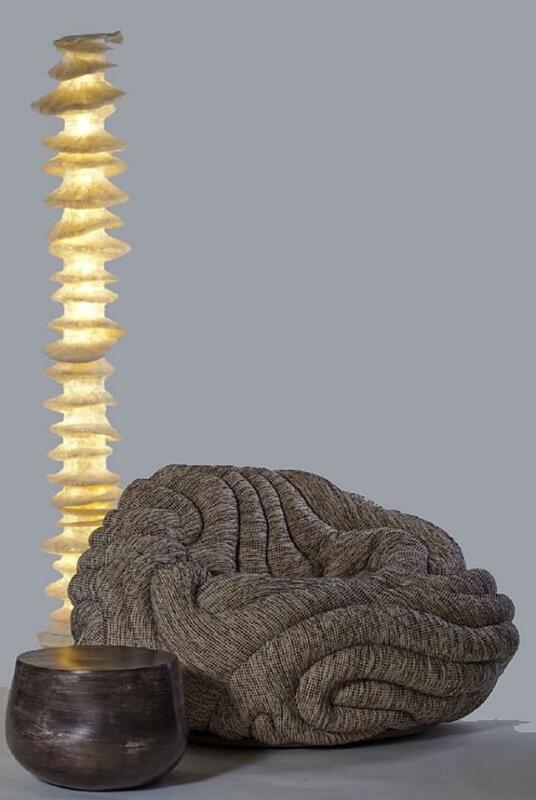 Designed by Ayala Serfaty, the handcrafted Apaya floor lamp was made in collaboration with textile artist Irit Dulman. The Gladis Lounge chair is hand-made from a variety of high-end fabrics provided by several textile manufacturers in different price ranges, among them Creation Baumann. The fabric is upholstered over ergonomically shaped polyurethane foam, designed for optimal comfort. Set on a swiveling ten-wheeled base allowing natural movement and positioning, the Gladis lounge chair radiates an ethereal quality enhanced by its hand-stitched details, thus providing a ripple effect, reminiscent of the fluid forms found in nature. Hand-sculpted out of clay, the Shasta table exhibits a simple and minimalistic aesthetic. With its organic shape, smooth contours and clean lines, this ceramic table doubles as a side coffee table as well as a sculptural element.